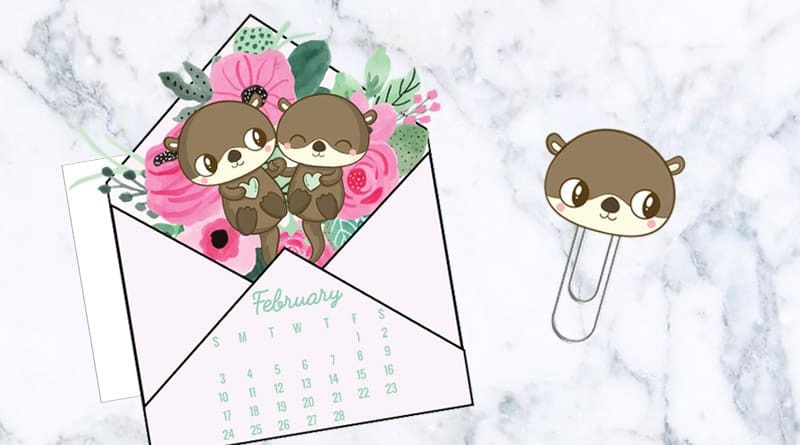 February is just a few days away so here’s a new calendar divider + paperclip printable duo to add to your planner next month (or any other month if you decide to print the blank undated version). 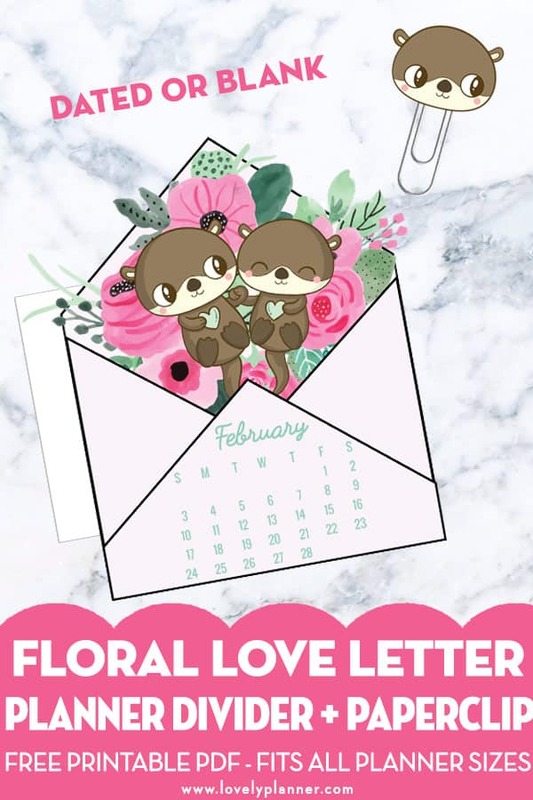 February being a pretty romantic month I’ve decided to include a cute loving otter couple and soft pink flowers. All of these cuties are cozied up inside an envelope. Can love letters get any cuter than that? As per the new routine, I’ve created this calendar divider/die cut + paperclip in two versions: a blank undated one that you can use anytime you’d like and a dated version (february 2019) that will help you keep a whole view of the month. Since you were unanimously enthusiastic about the blank PNG version I started including recently I’ll keep on doing that from now on, and will update older dividers progressively too. You can find all the calendar dividers here. On top of being cute, this calendar divider is also functional. It quickly gives you a whole month view, can help you find your page and is even more helpful to have around if you use an undated planner. Nobody likes to get dates mixed up. It’s also perfect if you use a bullet journal or travel notebook! Depending on where you punch your holes and how you place your divider in your planner you can get a different look: visible or not when your planner is closed. Plus, you punch holes yourself so this divider can fit in any type of planner! The PDF file also includes a mirrored verso of the divider. That means that you can actually have the mirrored divider on the back of your calendar. Glue both sides together before laminating it and punching holes in it! You don’t necessarily have to use it if you don’t want your divider to be cute on both sides. Plus, if you laminate your divider, you can use the verso to write important dates! to write important dates, notes or to dos on the back of my calendar ( the side with the blank elephant-verso). What I like about this pen is that it doesn’t smear like a whiteboard pen would. Plus, you can simply erase by swiping it with a wet napkin. , but you’ll need alcohol to rub off your writings. The pens I have are in size F.
scissors (or cutting machine) – the shapes are really simple so using scissors is probably just as quick! Open the pdf in Silhouette software directly if you have the Designer Edition. If you have the basic software, fear not and turn the PDF into a jpeg first, using this website. You can resize in Silhouette if you want. Use the Print and cut function through your Silhouette software. Note: I’m including a print ready PDF file (2 pages: dated & blank undated) and an undated PNG version (that you can/should resize) of the design in case you’d like to use this printable for a different month or for a different use (die cut, divider, digital planner, etc). Simply download the file you need. Not a subscriber yet? Some of my free printables are for newsletter subscribers only (it’s totally FREE of course!). The monthly calendar dividers are some of them. Subscribe to my newsletter to get free access to exclusive free printables and stay updated. Existing subscribers – forgot your password? 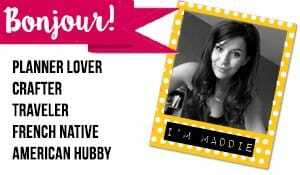 Make sure to check one of my emails to you, the password is reminded at the end of each newsletter. No caps, no space.